G20 term president Turkey hosts the G20 leaders' summit in the Mediterranean city of Antalya on Nov. 15-16. But Turkey aims for much more than hosting the leaders' summit during its presidency. Apart from prioritizing the three I's of inclusiveness, implementation and investment during its G20 term presidency, Turkey also recently hosted Women 20 (W20) meetings and will host the G20 energy ministers meeting for the first time. 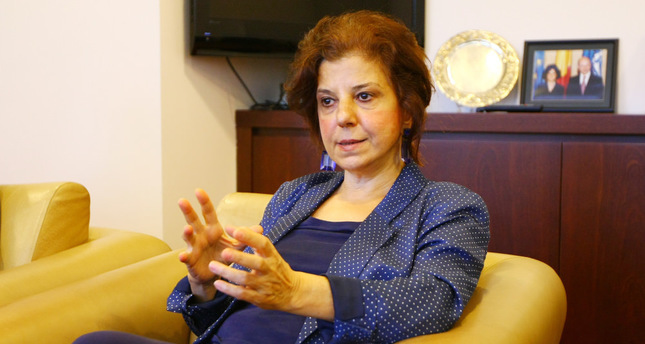 Daily Sabah spoke with Turkey's G20 Sherpa Ambassador Ayşe Sinirlioğlu about Turkey's priorities and ongoing work during Turkey's G20 term presidency. Ambassador Sinirlioğlu said they determined that youth and women have to be prioritized to increase employment and prevent economic inequality and therefore made a commitment to decrease the 150 million unemployed and uneducated youth in G20 countries by 15 percent by 2025. Ambassador Sinirlioğlu added that the issue of migration will be on the agenda of the G20 leaders' summit and said President Erdoğan will discuss this issue when he gets together with the other G20 leaders. DS: Turkey prioritized inclusiveness, implementation, and investment during its G20 presidency. Why were these concepts specifically chosen? We assumed the G20 presidency last December. First, we sought answers to the questions "What should be prioritized?" "What specific targets should we focus on?" "How do we want the Turkish Presidency to be remembered?" When we look at the world economy, we see that economic inequality has been increasing across many countries. This is true for developing and developed countries alike. For example, in OECD countries income inequality is at its highest level in 30 years. While inequality has important social and political repercussions, research by international institutions such as the IMF and the OECD show that higher inequality also hampers economic growth. The overarching goal of the G20 is strong, sustainable and balanced economic growth. As the Turkish Presidency, we decided to add inclusive growth to this formulation. We are approaching inequality from both of its dimensions: within and among nations. Reaching out to low-income and developing countries and building better bridges with non-G20 countries has been an important Presidency priority in this regard. Our second priority is implementation. The aim here was to ensure that words are translated into deeds; that past decisions and commitments undertaken by the G20 are implemented. That is why across all work areas of the G20 we aimed to establish strong and robust accountability mechanisms to monitor our progress in achieving our commitments. Our third priority is investment. Investment in infrastructure is one of the drivers of economic growth and jobs. The global investment gap by 2030 is estimated at $70 trillion. The quality as well as the quantity of investment is critical. This is why we requested that G20 countries develop ambitious and comprehensive national investment strategies. These strategies will be presented to our leaders in Antalya. DS: Could you give some specific examples of the progress the G20 has made on these priorities? Youth and women are two of the most vulnerable groups in our economies, and they have been prioritized in our inclusiveness agenda. Since the 2008 crisis, youth unemployment has reached unacceptably high levels. With the exception of very few countries, the youth unemployment rate is double or triple the general unemployment rate. This year the Turkish Presidency has worked hard to achieve a collective G20 commitment to reduce the percentage of the most vulnerable youth in G20 countries -- those who are neither at work nor in education or informally employed -- by 15 percent by 2025. This is a concrete target that will be endorsed by the G20 leaders in the Antalya summit. Regarding women, a commitment was made last year to decrease the gap in female and male labor force participation rates by 25 percent by 2025. By doing so, we will bring an additional 100 million women into the labor force. This year under our Presidency, we developed a robust monitoring template to help us reach this collective target. Along with low-income and developing countries, we identified small and medium-sized enterprises (SME) as a crosscutting priority that we would highlight across all work areas of the G20. Although they are very important sources of growth and employment in our economies, SMEs have found it increasingly difficult to access financing since the global crisis. The World SME Forum was established in Istanbul with the cooperation of TOBB and the International Chamber of Commerce. This Forum will be an important advocacy platform for the interests of SMEs at the global level. Last year, G20 countries committed to structural reforms, which, if implemented, are calculated to lift our collective GDP by 2.1 percent by 2018. Collectively, more than 1,000 policy commitments were made by G20 members. Subsequent to Brisbane, downgrades to global economic growth projections have further highlighted the importance of the implementation of these measures. This year we worked with G20 members to develop a robust accountability mechanism to monitor our progress in meeting this important commitment. The first accountability report in this regard will be submitted to G20 leaders in Antalya. DS: This year, a meeting of G20 energy ministers will be held for the first time. Could you please tell our readers why these meetings will be held? As you have indicated, for the first time, we will have the meeting of G20 energy ministers in Istanbul on Oct. 2. Last year, G20 leaders agreed on Energy Principles, a list of nine principles to guide the work of the G20 in this regard. This year, we gave particular focus to the first of these principles, which is access to energy for all. Throughout the world, 1.3 billion people do not have access to electricity. This problem is most dire on two continents: Asia and Africa. We decided to focus on sub-Saharan Africa this year because the problem there is most acute. There, 650 million people out of 920 million do not have access to energy. There are various initiatives and projects to address the problem. We think the G20 can add value by helping meet the important need of coordination among these different initiatives. Our focus will be on regulatory and policy frameworks, access to financing and technology. One day prior to the G20 Energy Ministers Meeting on Oct. 1, we are organizing an international conference in Istanbul with the participation of G20 ministers, energy ministers from African countries, institutional investors and representatives of international organizations. DS: This year, there will be a meeting of G20 agriculture ministers. This is not done on an annual basis. What is the reason for this meeting? Under our Presidency, the meeting of ministers of agriculture was held for the second time in G20 history. The first was held under France's presidency. This year in May, our ministers discussed sustainable food systems and food security with a particular focus on food loss and waste. Every year, we spend $1 trillion producing food that is eventually lost or wasted. The reasons are various: In developing countries food is lost mainly at the post-harvest stage and transport due to the lack of proper infrastructure, whereas in developed countries food is lost mainly due to consumer behavior. If food loss and waste could be eliminated, we would have the resources to feed an additional 2 billion people. There is also an environmental dimension to this issue, as 7 percent of the total emission of greenhouse gases is caused by wasted food that produces methane gas. The G20 agriculture ministers agreed on the establishment of a technical platform whose purpose will be to first help develop a common measurement of food loss. Then we will look at ways to collaborate to reduce this phenomenon. This platform will be open to the participation of all countries. DS: Trade is an important topic for sustainable development. What has been done in the field of trade this year? This is another subject we have focused on this year. G20 ministers of trade meet on Oct. 5-6 in Istanbul. We approached this subject from three perspectives this year. The first dimension is about the slowdown in global trade. Until 2008, global trade was growing by an average of 6-7 percent per year. Since 2008, this has slowed to 3-3.5 percent. In 2015, the projections are for even slower growth in global trade. We asked international organizations – the World Bank, the IMF and the WTO – to study whether structural or cyclical factors were behind this phenomenon. The institutions have worked on this and prepared a report that identified a combination of structural and cyclical reasons. In light of this study, ministers of trade will discuss how to respond to the trade slowdown. Regarding the cyclical factors, we have seen that trade tends to recover later than overall economic activity following financial crises. With the 2008 crisis, many countries resorted to protectionist measures. The G20 is committed to standstill and rollback; however, many protectionist measures remain in place. On the structural level, the composition of trade is changing. Countries that previously outsourced the production of intermediate goods have started to produce these goods by themselves. This has led to falls in the global trade volume.Last year at the Brisbane summit, G20 leaders discussed trade at length and asked the question, "How can the multilateral trade system work better?" This year in Antalya, they will continue this discussion. The WTO director general has been asked to present a report to the leaders with his findings and recommendations. There is also a substantial increase in regional trade agreements. This is a reality. However, regional trade agreements should be compatible and complementary with the existing multilateral system. If the multilateral system fails, this will harm all countries, developed and developing alike. The proliferation of RTAs and its consequences will be on the agenda of the ministers of trade meeting. DS: This year for the first time, Women 20 (W20) meetings were held as a part of G20 meetings. Could you explain why these meetings were held? The establishment of the W20 is an initiative of the Turkish Presidency that we worked very hard to achieve. President Erdoğan was a very important source of support and encouragement for the W20. As you know G20 is an official platform, but it also has some engagement groups that establish a bridge between the world and the G20. These are Civil 20, Business 20, Labor 20, Youth 20 and Think 20. This year, we added W20 to this list. At first some G20 members had some questions on whether to establish W20 as a separate, standalone group since women's issues were already present in other work areas of the G20. We were able to achieve consensus to establish W20 as a platform to help mainstream gender inclusive economic growth in the G20 and help monitor our commitments on gender issues. The official launch of the W20 was held in early September with the participation of Prime Minister Davutoğlu. DS: While the G20 brings the most developed 20 countries together, Turkey's term presidency also tried to include less developed countries' representatives in the meetings. What caused this action? First of all, as you know, Turkey has a special interest in low-income developing countries, promoting their development and their better integration into the global economic system. This is one of the essential elements of our foreign policy. Therefore, we saw our G20 presidency as an opportunity. We devoted our efforts to strengthen the dialogue between these countries and the G20. In addition, this year is a crucial year for the global development agenda. We felt a special responsibility to prioritize low-income developing countries. This year we have three important processes under the UN: namely, the Financing for Development Conference, which was held in Addis Ababa in July, the Sustainable Development Goals summit to be held later this month in New York, and the Climate Change summit in Paris in December. The strong political support of the G20 to these processes will be crucial. DS: In recent meetings of G20 finance and labor ministers the issue of migration was discussed. Could this issue also be included in the G20 meetings? This issue saddens us all. President Erdoğan has indicated that the refugee crisis will be one of the issues that will be discussed at the Antalya summit. DS: It is said that the migrants may have a positive effect in developed countries' economies. What are your opinions on this subject? I will share my personal views here. Europe has an aging population. The integration of a young labor force will be beneficial for European economies. As a diplomat, I served in the region, in Syria and Jordan. The people there, they are not any different from us, many of them have skills and education. They have an educated work force that includes students, doctors, dentists and engineers. They have the capacity to overcome the language barrier and will definitely become integrated in the society they are in if they are given the chance. This will also lead to more cultural diversity, which is important. It is important in making a society more open and inclusive. Turkey is a good example in this respect, as we do not have any issues living with people of different cultural and religious backgrounds. In my opinion, they will ultimately be beneficial, while there may be a need to at first.